Every feature is accessed via easy to understand menu options. The average time to learn the software is 15 minutes and most clients are busy entering their information within an hour. Anyone familiar with Windows can operate the software with No formal training. Plus with multiple concurrent windows open, you can easily jump from module to module. The Web SIMPLE Records Manager provides for protecting and limiting access to the information being managed. 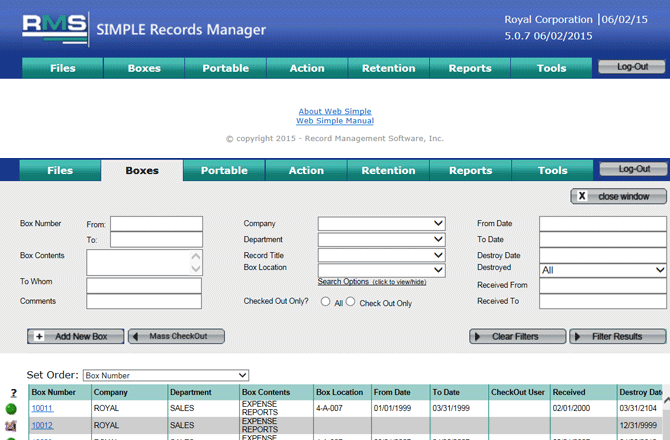 The Web SIMPLE Records Manager provides for protecting and limiting access to the information being managed. Each individual needing access can be provided with a USER ID and a PASSWORD. These are usually assigned by the System Administrator or the Records Manager. When assigning a User ID and Password you have the ability to "turn on" or "turn off" each push button and menu item, thus customizing what this individual can do. You also can indicate which Company and/or Company and Department they are restricted to. User Groups allow you to create profiles to quickly assign new users.